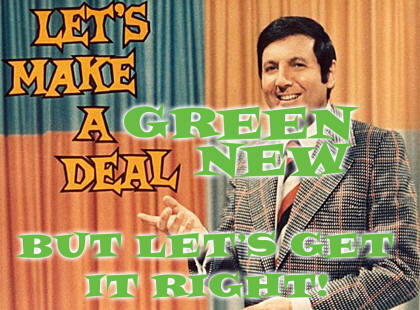 Rep. Alexandria Ocasio-Cortez (D-NY) and Senator Edward Markey (D- MA) have introduced the "Green New Deal," a congressional resolution which lays out a grand plan for tackling climate change. It aims to cut greenhouse gas emissions by 50% by 2030. To achieve that goal the plan calls for the United States to switch to 100% renewable energy in 10 years. In 2017 only 11% of the nation's energy consumption came from renewables, with another 9% generated by nuclear energy. What sparked this initiative were reports by the United Nations and by federal scientists who warned that if global temperatures continue to rise, the world is headed for more intense heat waves, wildfires and droughts. Carbon emissions rose by 3.4% last year in the U.S. and 2.7% globally. The first major goal is to shift 100% of national power generation to renewable sources, such as wind and solar. Second, to build a national energy-efficient "smart" grid. Third, to upgrade all buildings to become energy-efficient. Fourth, to decarbonize manufacturing and agricultural industry. Fifth, to upgrade the nation's infrastructure, especially transportation. For example, the government must push for more zero-emissions vehicles, such as Tesla that uses batteries to provide electric power. Interestingly, Tesla sales soared from 2,400 cars in 2012 to a stunning 90,700 in the fourth quarter of 2016. It is now America's 4th best-selling car. Yet it is more expensive than competitive cars of the same size. However, only about 1.1 million electric cars were sold last year, and 30 million must be sold annually to achieve carbon reduction goals. One state which is pioneering practical strategies to reduce carbon emissions is California. It set a goal to achieve a carbon-neutral energy status within 30 years. At present the state is currently at 32% of achieving that goal. No state has done a better job of reducing its energy consumption. California just approved a measure that will require solar panels on new houses in 2020. Exemptions will be granted to houses that are in shade. But the new law includes incentives for people to add a high capacity battery to their home's electrical system, to store sun energy. The cost of solar panels and other improvements will add nearly $10,000 to the cost of a home - a cost that will balance out over time, due to lower electric bills that will save $19,000 over a 30 year mortgage. The state has set a goal for California to get 60% of its electricity from clean sources by 2030 and 100% by 2045. Analysts have called the measure "the most important climate law on the books in the United States." The new law, signed by Gov. Jerry Brown in his last weeks in office, also allocates funds to modernize and expand electric-vehicle-charging infrastructure. It also fast-tracks access to energy efficiency programs for the state's largest energy consumers (agriculture and industry) and allows customers to purchase their power directly from independent sources, rather than utilities. The "Green New Deal" was obviously inspired in part by Franklin Roosevelt's New Deal which passed dozens of laws designed to lift America out of the Depression of the 1930s. It created 47 programs such as the Civilian Conservation Corps to create jobs and improve the environment. However, the Green New Deal would also make universal health care available and guarantee a job to every American. This is a major mistake. Neither issue has anything to do with reducing carbon emissions and climate change. They would add hundreds of billions to the cost, and decrease the odds that the Green New Deal will ever be passed. Rep. Ocasio-Cortez shrugs her shoulders, telling TIME in a cover story about her, the Green New Deal is "a statement. It's a vision statement. And people want to pick it apart to death." Of course, hybrid cars cost more. A Kia Optima Hybrid sells for $31,865, or about $2,000 more than the non-hybrid version. But the gas savings earn back the cost in 4.5 years. These are the kinds of issues the Green New Deal should be raising with voters - not Medicare for All that has nothing to do with climate change. Our priority must be to save our planet.